Visual checklists use task pins to indicate tasks for each room. 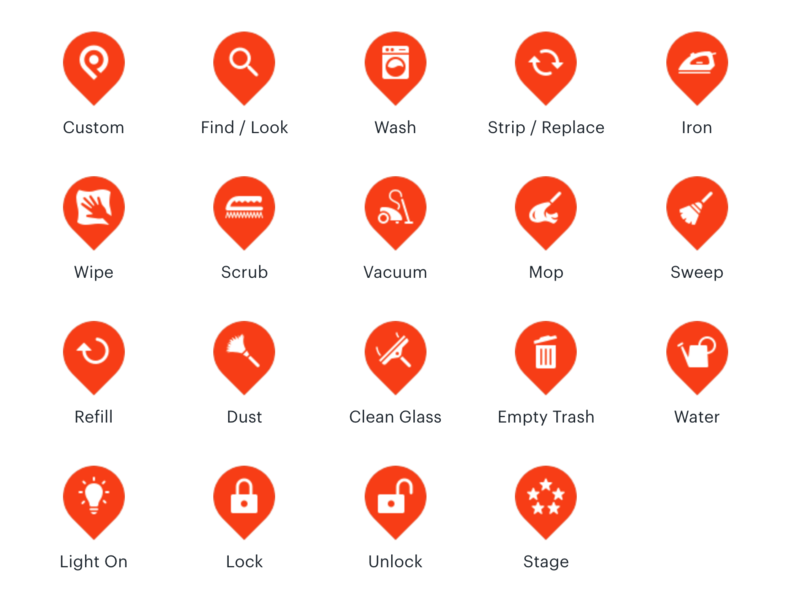 Learn what each task pin signifies here. Custom: This pin appears whenever the task isn't described by one of the other pins above. Examples: put the pillows back on the couch; check for hair on the beds; order more supplies from Amazon. Find / Look: Use for any task where an item needs to be located or examined for problems. Examples: find the remote control and place on side table; check to see if there are crumbs under the couch cushions. Stage: Use this ping to let your service provider know to arrange the room the way it looks in the reference photo. "Staging" means arranging the linens, pillows, knickknacks, and other decor items in a pleasing way.